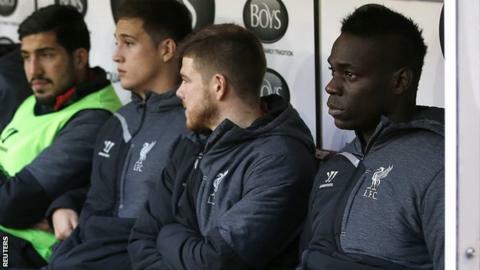 Liverpool boss Brendan Rodgers has no plans to offload Mario Balotelli during the January transfer window. The 24-year-old striker, who has scored twice in 15 games, has been linked with a return to Inter Milan by Italian newspaper Gazzetta dello Sport. "It's not something I have even thought about, to be honest," said Rodgers. "We've had a lot of games this season in a lot of competitions and, at this moment in time, the key for me is to keep this squad together." Liverpool were runners-up in the Premier League last season and were renowned for a high-intensity pressing style. Before the 1-0 win at Burnley on Boxing Day, Rodgers admitted: "Working with Mario, we see he is someone who is better in and around the box so that level of intensity and pressing isn't part of his game." Meanwhile, keeper Brad Jones will have a scan to determine the extent of the thigh injury that caused him to go off at Turf Moor on Friday. His withdrawal meant a return to the first team for Simon Mignolet, who had been dropped for the previous three matches. "In the main Simon is a very resilient character," said Rodgers. "Like everyone, he's taken a bit of stick but to operate at this level you have to be able to deal with that. "He had a couple of edgy moments at Burnley and he'll recognise that. But he ended the game with a clean sheet. "That's what he will want as a goalkeeper and what we want as a team."